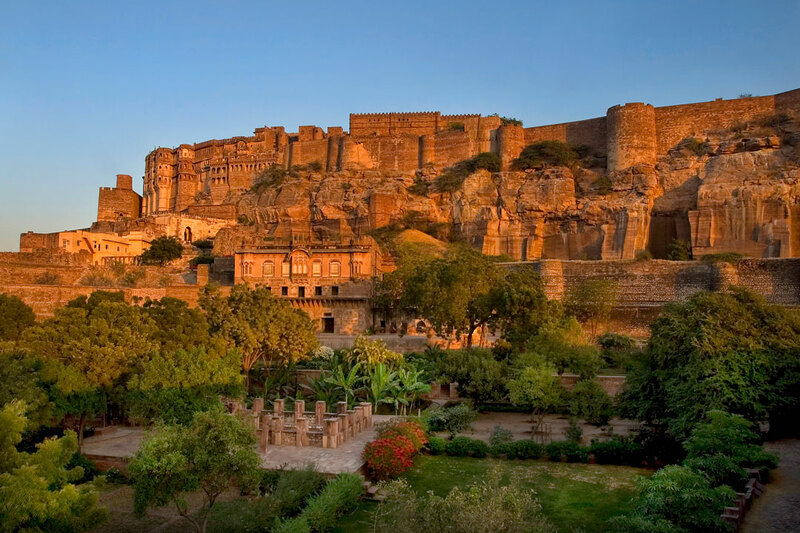 Five centuries of magnificent art celebrate the rich artistic traditions of the kingdom of Marwar-Jodhpur. Many of the 250 extraordinary objects are on display outside their palace setting for the very first time. Vibrant paintings, intricate furnishings, fine jewelry, and decorated arms and armor, presented beside videos and large-scale photomurals, evoke the stunning atmosphere of the Mehrangarh Fort and the city of Jodhpur—the permanent home of the works on view. 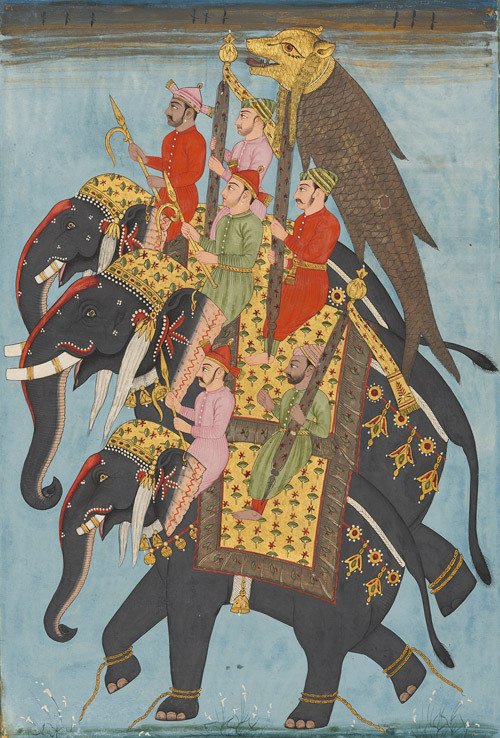 This exhibition celebrating the art of India is so expansive, it will be shown on both the third floor in the Ebsworth Gallery and on the fourth floor in the Simonyi Galleries. This exhibition is organized by the Museum of Fine Arts, Houston, in collaboration with Mehrangarh Museum Trust, Jodhpur, India. You are greeted with fanfare as you enter this large exhibition on the museum’s third floor. A dramatic re-creation of a royal wedding procession moves through the galleries and sets the stage for the crucial role that marital alliances played in the lives of the citizens of Marwar-Jodhpur and in the development of the region’s aesthetic traditions. 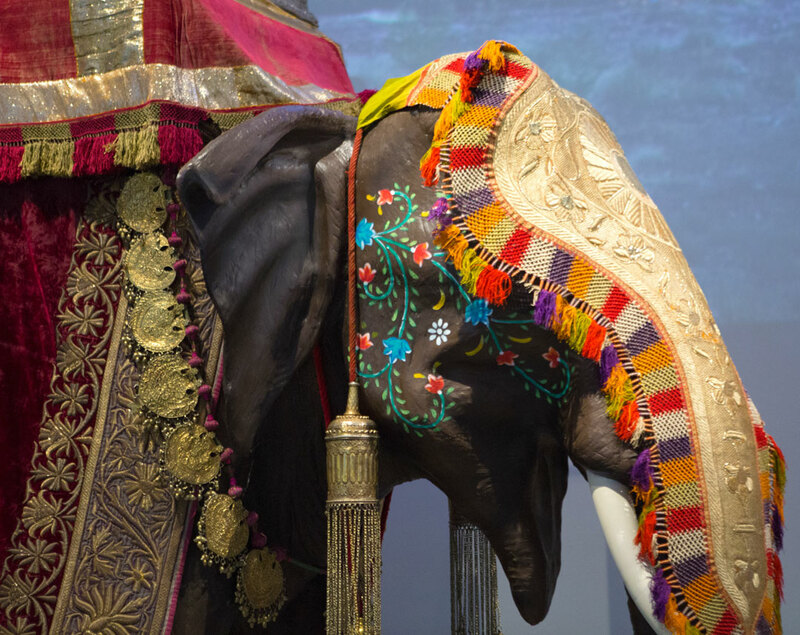 Life-size horse and elephant mannequins fill the space, adorned with an elephant howdah (seat), wedding regalia, and royal insignia. Video projections feature preparations for a 21st-century wedding and an aerial view of the Mehrangarh Fort, which encloses palaces, temples, and courtyards. A photographic montage introduces the desert landscape of Marwar-Jodhpur, its diverse peoples, and the exhibition’s central patrons: the Rathore clan that ruled the region from the 13th to the mid-20th century. They trace their descent from the sun god, Surya, and consider the Hindu god Rama to be one of their ancestors. This divine genealogy has been recited by bards for centuries and, for centuries, and, for that long, Rathore kings have encouraged both the production of large public art forms and the intimate art of paintings. 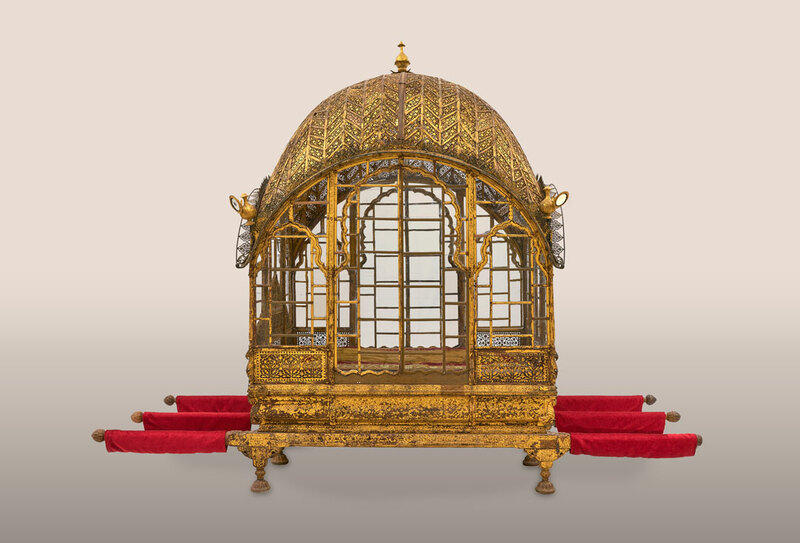 A giltwood and glass mahadol (palanquin) underlines the Rathores’ emphasis on dignified processions for kings and queens, and a large cradle for the Hindu deity Krishna demonstrates their spiritual leadership. It is no coincidence that the origin of the English word “mogul” comes from the name of the Mughal Empire. In 1561, the Mughal Empire began centuries of political and military alliances between the Mughals and the Rathores. Paintings of the court and portraits of kings from the 17th and 18th century illustrate the history that led to the movement of objects throughout these alliances in the 16th and 17th centuries. A wide array of ornate sabers, daggers, and rifles flanks the extraordinary 17th-century Lal Dera tent, one of the oldest, if not the only, intact Indian military tents in existence. The exhibition explores the role of royal women in the Rathore court. 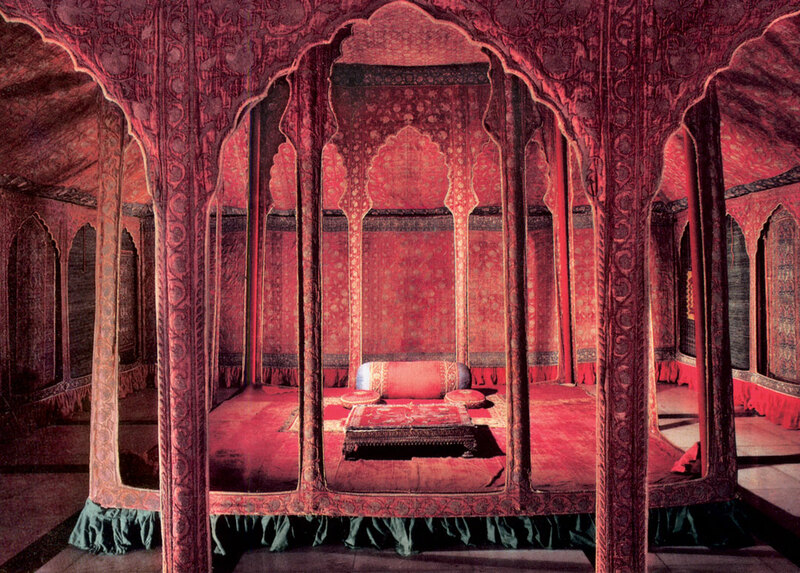 Paintings, carpets, textiles, and jewelry evoke the setting of a royal zenana, the women’s wing of a Rathore palace. The zenana is a hub of language, exchange, and culture led by the women of the court. They played a crucial role as agents of cultural change and patrons of the arts, preserving cultural traditions of festivals and dress throughout the centuries. 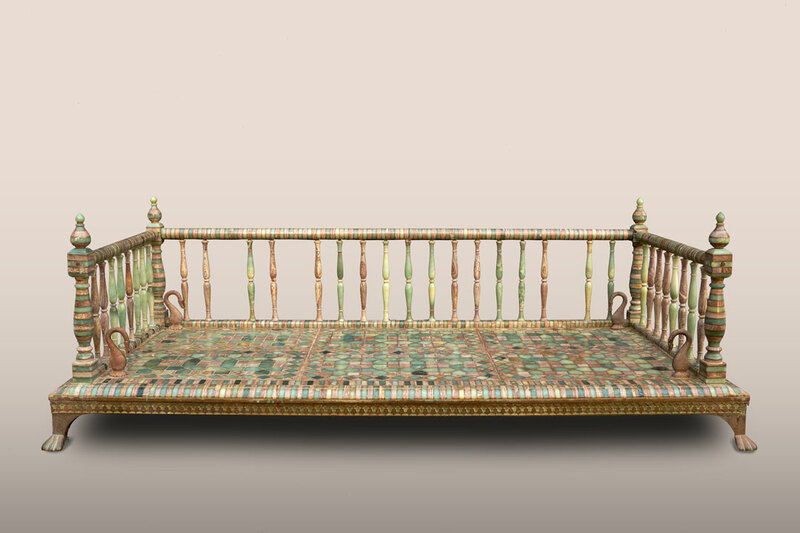 Among the furnishings shown in this section is an exceptional wood baradari (pavilion). A sequence of paintings emphasize the unique role of women as patrons of festivals that marked the seasons. Today, the zenana still functions but as an open entity. The current queen and princess continue to celebrate traditional festivals with the public of Jodhpur. As Mughal influence began to decline in the late 18th century, artists, craftspeople, and nearby dynastic kingdoms were attracted to Jodhpur due to its increased stature. This shift is seen in paintings of durbars (royal receptions) staged by the Rathores. 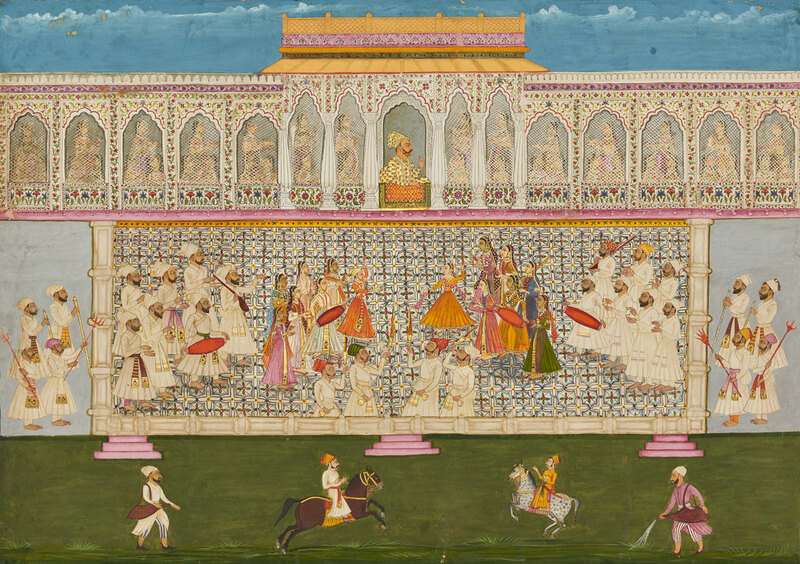 The durbar was one of the most important displays of the Rathore’s political and royal vitality. 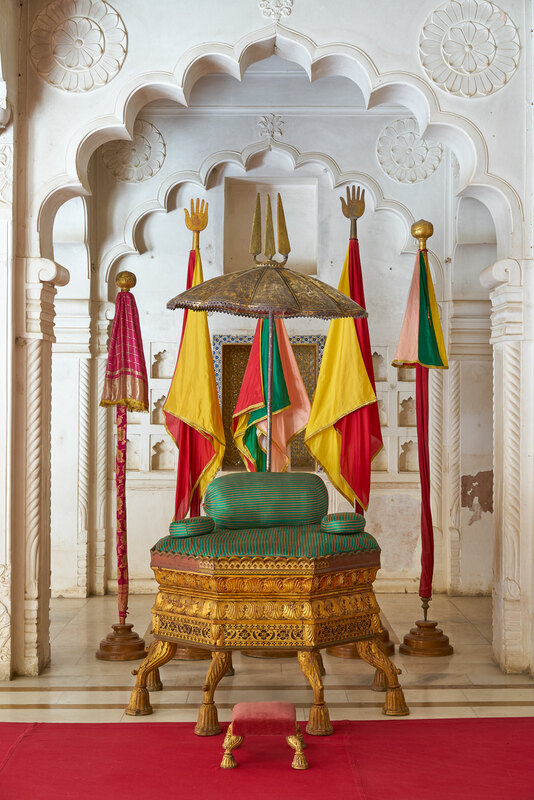 Located in either exquisite halls or courtyards, the durbar was an arena in which the maharaja’s majesty and his noblemen’s loyalty were emphasized. A trend of exchanging artworks as gifts grew out of this period of intense creativity in artistic production and a cross-fertilization of Mughal and Rathore styles, seen in the woven canopy and textiles, finely crafted arms and armor, and 18th- and 19th-century paintings on view. A dramatic transformation in Jodhpur is triggered by India’s encounters with the British Empire in the 19th century. By 1876, Queen Victoria took the title of Empress of India and set off a new wave of European aesthetics. 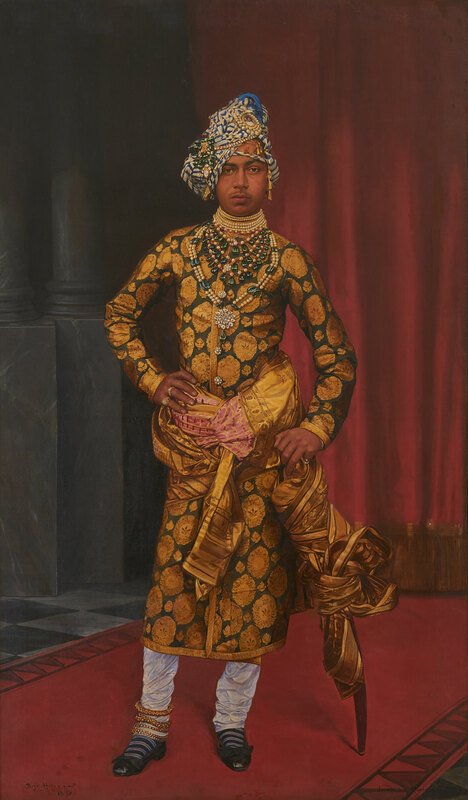 Merging with traditional Indian garments, paintings, and jewelry, an imperial hierarchy was emphasized during the era of British rule known as the Raj. During the 20th century, the maharajas of Jodhpur became renowned for innovative patronage. 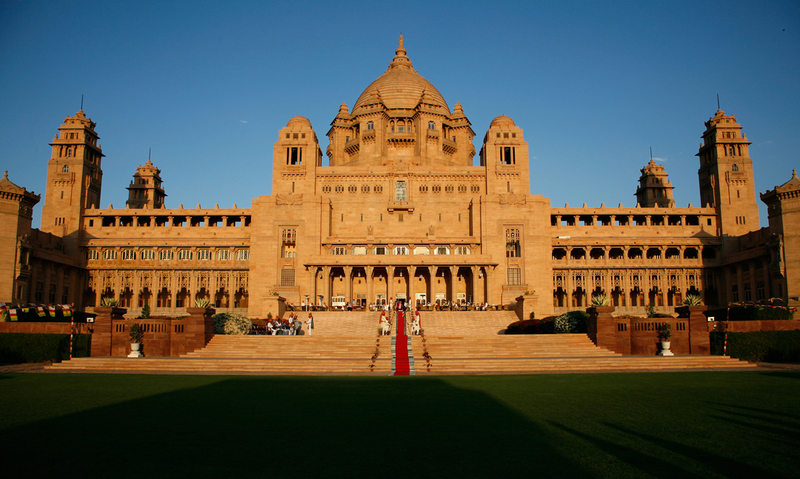 In 1944, Umaid Bhawan Palace was completed and is now operated as a hotel by the Taj group. Today, this legacy continues with the current leader of Marwar-Jodhpur, His Highness Maharaja Gaj Singh II. 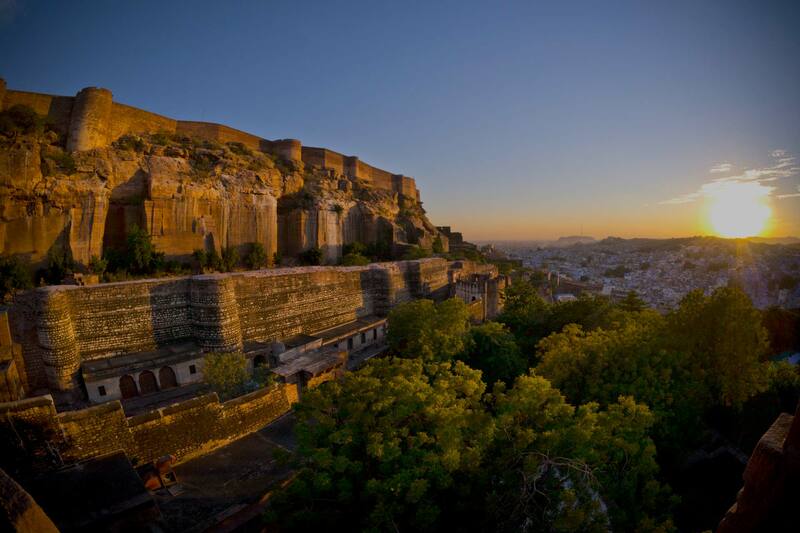 Images: Western Ramparts of the Mehrangarh Fort, Jodhpur, photo: Neil Greentree. 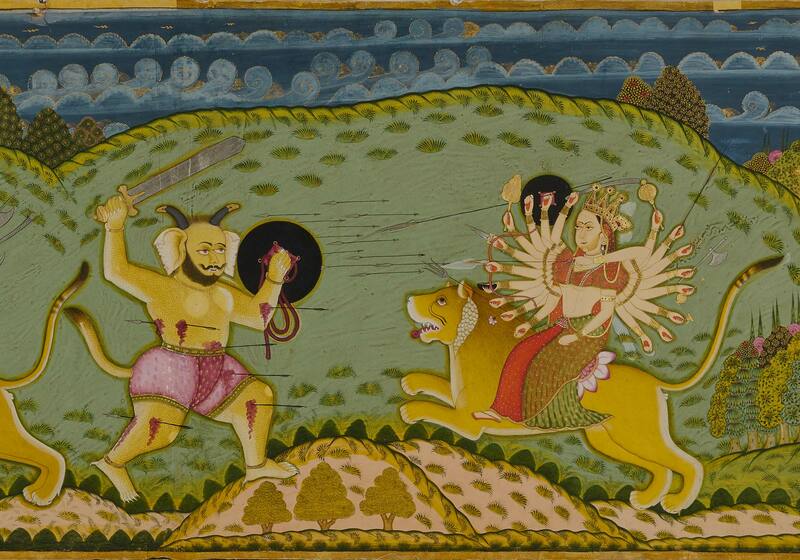 The Goddess Fights the Buffalo Demon, Folio 20 from the Durga Charit (detail), ca. 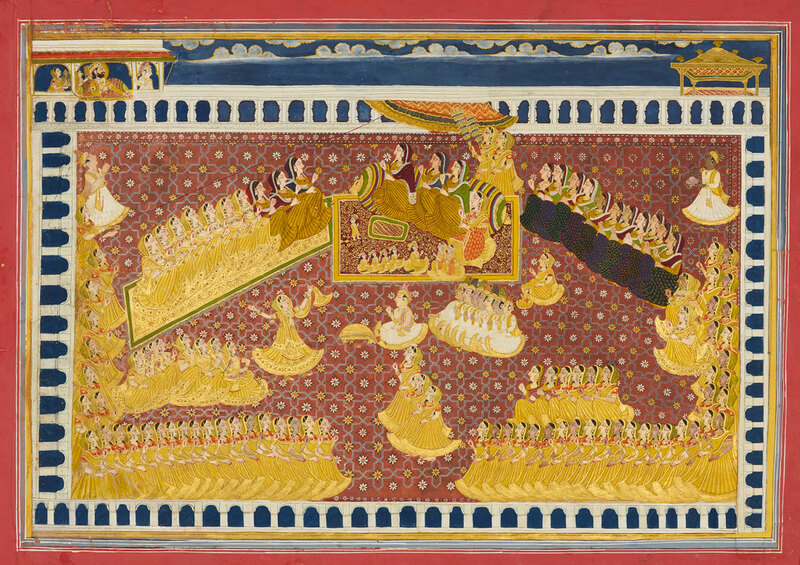 1780-90, Jodhpur, opaque watercolor and gold on paper, 50 × 18 7/8 in., Mehrangarh Museum Trust, photo: Neil Greentree. 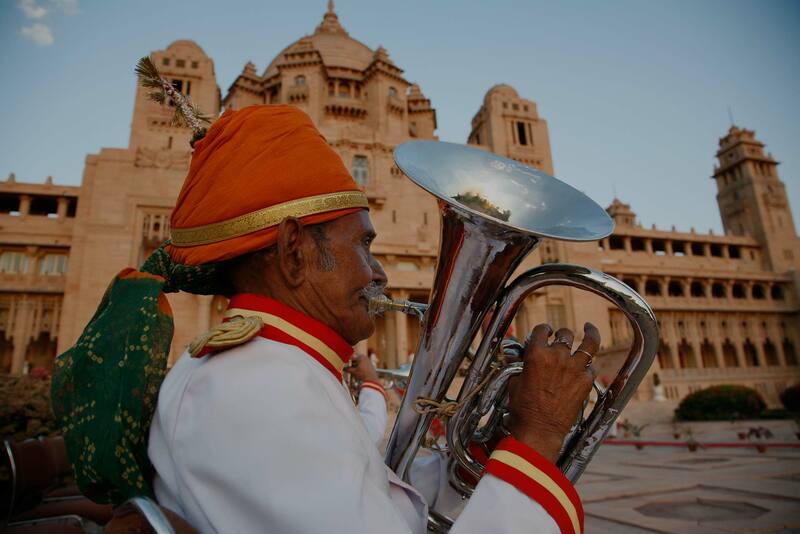 Band member on the steps of Umaid Bhawan during a celebration, photo: Neil Greentree. 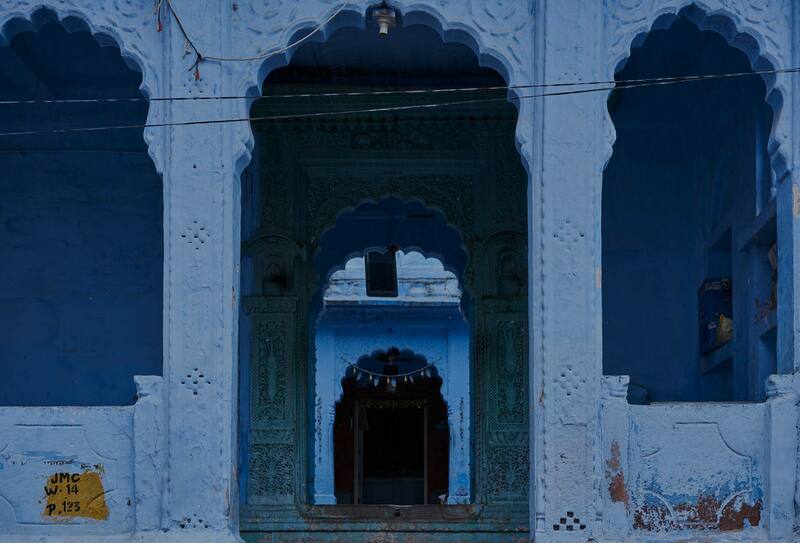 Doorway in the blue city, photo: Neil Greentree. Shiva and Parvati in Conversation; Shiva on His Vimana (Aircraft) with Himalaya, Folio 53 from the Shiva Rahasya, 1827, Jodhpur, opaque watercolor and gold on paper, 16 1/2 × 45 5/8 in., Mehrangarh Museum Trust, photo: Neil Greentree. Mehrangarh Fort high on an outcrop of red sandstone showing Jaswant Thada in the foreground and the blue city of Jodhpur (detail), photo: Neil Greentree. 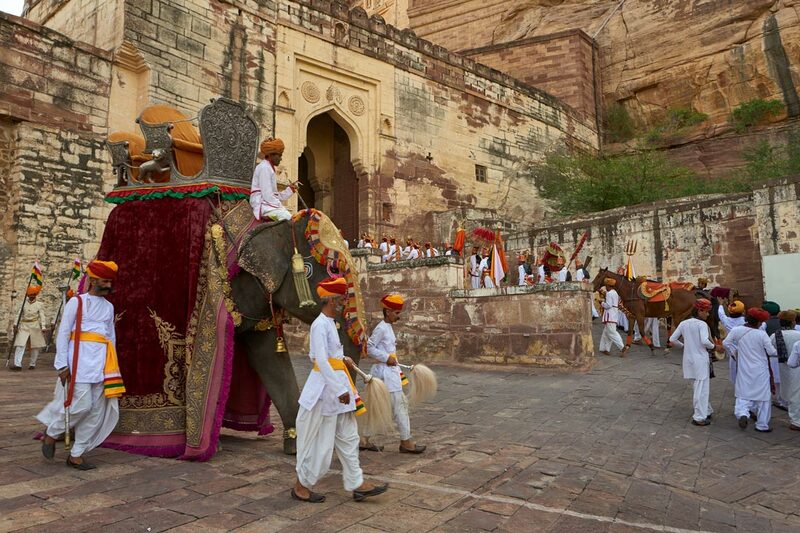 Royal Procession recreated at Mehrangarh Fort, Jodhpur, photo: Neil Greentree. The Mahi-o-maratib (Fish Insignia) in Procession, ca. 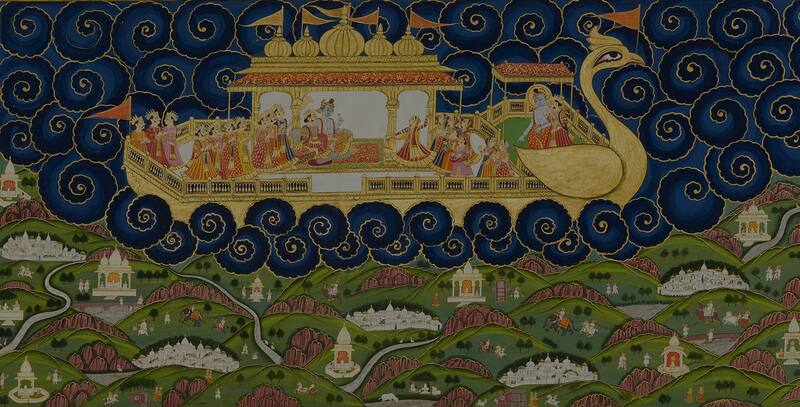 1715, Jodhpur, opaque watercolor and gold on paper, 11 1/4 × 8 1/8 in., Mehrangarh Museum Trust, photo: Neil Greentree. 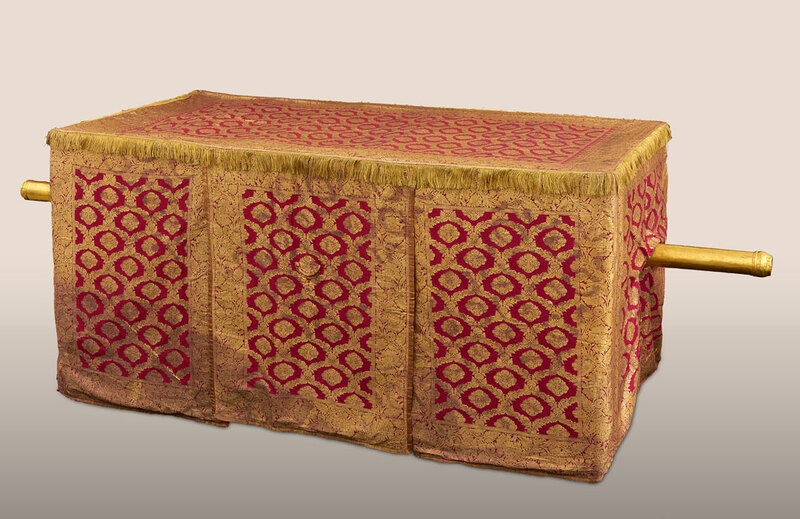 Cover for a Lady’s Palanquin, late 19th century or early 20th century, Varanasi, silk brocade, 39 x 77 3/16 x 39 3/4 in., Mehrangarh Museum Trust, photo: Neil Greentree. Installation view of Peacock in the Desert: The Royal Arts of Jodhpur, India at the Museum of Fine Arts, Houston, photo: Will Michels. 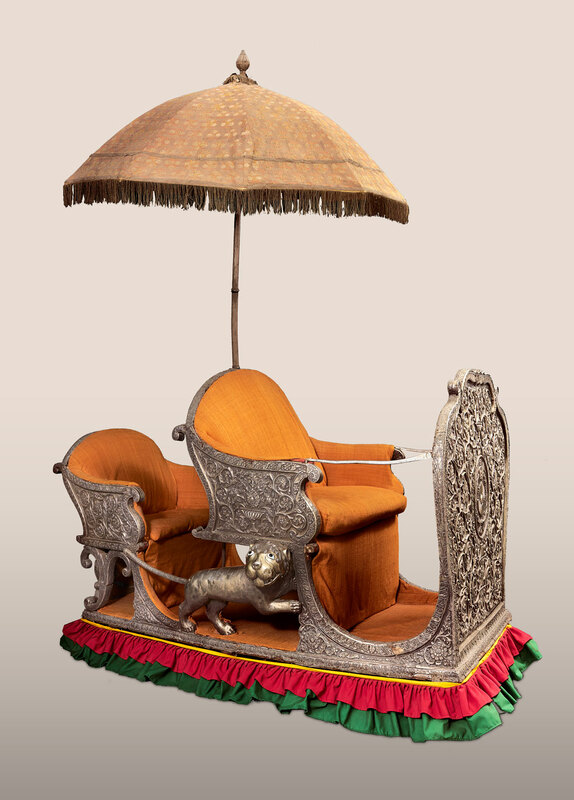 Howdah with Chattr (Elephant Seat with Parasol), early 19th century, Jodhpur, wood, silver, velvet, silver gilt thread embroidery, gilded metal finials and cotton frills, enamel, silk brocade, 59 x 36 5/8 x 46 1/2 in., Mehrangarh Museum Trust, photo: Neil Greentree. Mehrangarh Fort, Jodhpur, photo: Neil Greentree. Mahadol (Palanquin), ca. 1700–30, Gujarat, gilded wood, glass, copper and ferrous alloy, 100 3/8 × 143 3/4 × 57 1/8in., Mehrangarh Museum Trust, photo: Neil Greentree. Krishna Jhula (Cradle for Krishna), late 19th century, Rajasthan, gilded wood, glass, paint, lacquer, 111 7/8 x 68 1/8 x 32 3/8 in., Mehrangarh Museum Trust, photo: Neil Greentree. 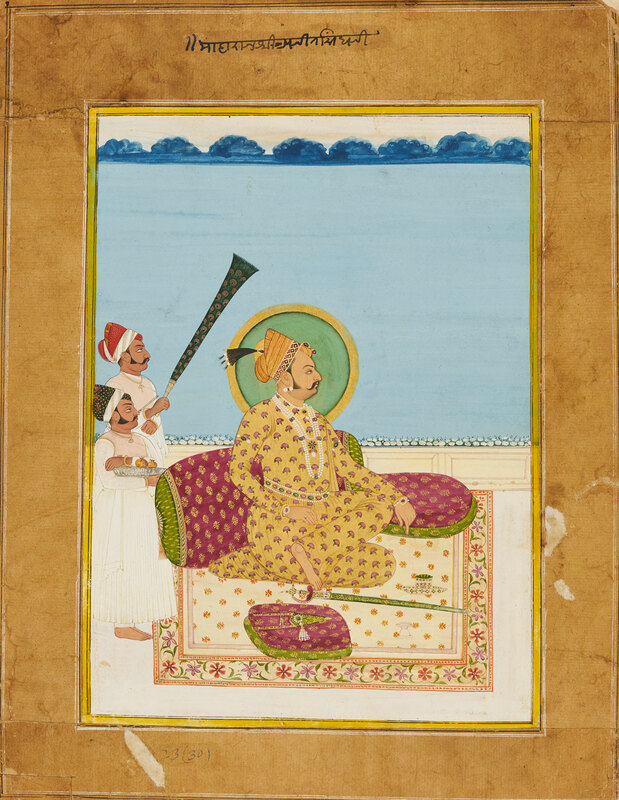 Portrait of Maharaja Ajit Singh, ca. 1830, Amardas Bhatti, Jodhpur, opaque watercolor and gold on paper, 16 7/8 × 13 1/8 in., Mehrangarh Museum Trust, photo: Neil Greentree. The Lal Dera, late 17th to early 18th century, Mughal, silk velvet, silver gilt thread, cotton backing, Mehrangarh Museum Trust. 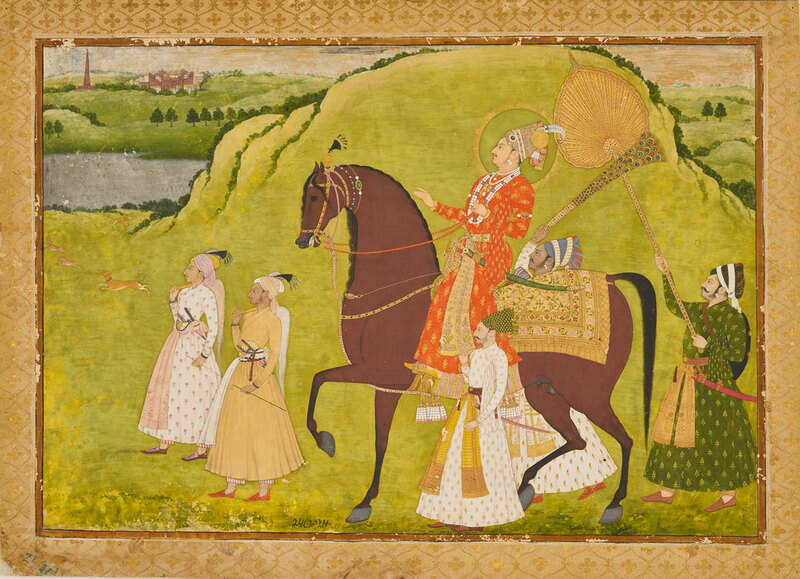 Maharaja Abhai Singh on Horseback, ca. 1725, Dalchand, Jodhpur, opaque watercolor and gold on paper, 14 1/8 × 19 5/8 in., Mehrangarh Museum Trust, photo: Neil Greentree. 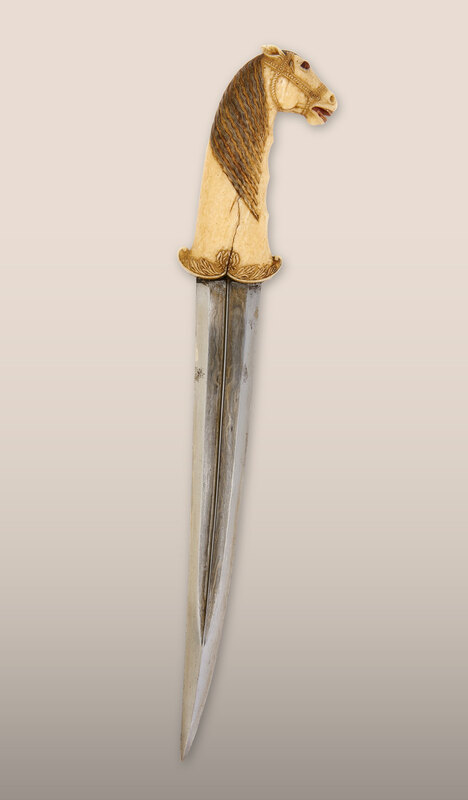 Khanjar (Dagger), late 17th or early 18th century, Rajput, watered steel, ivory (Indian elephant), 14 1/4 x 1 1/4 in., Mehrangarh Museum Trust, photo: Neil Greentree. 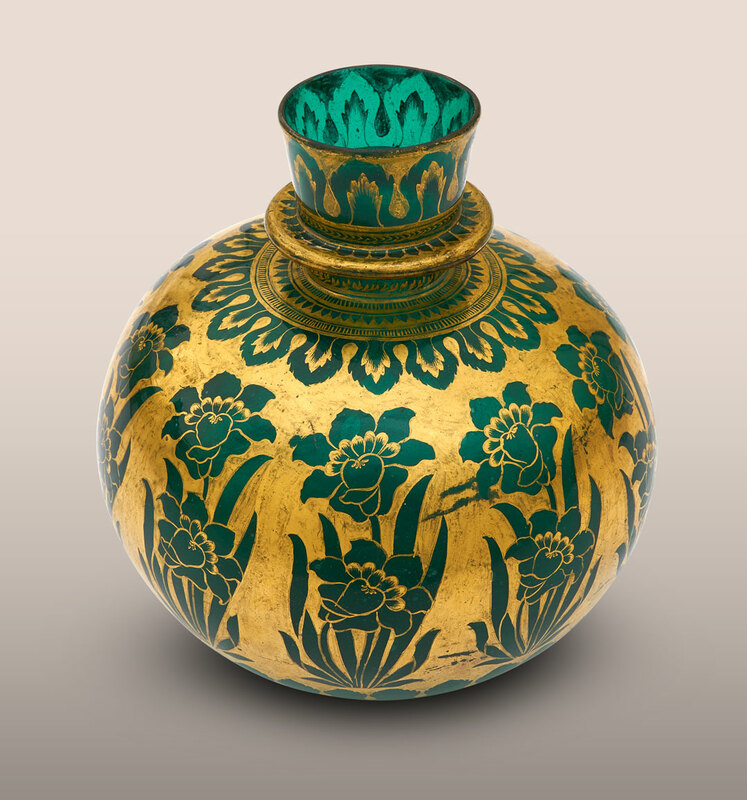 Huqqa (Water Pipe) Base, early 18th century, Mughal, glass, gold paint, 7 7/8 × 3 1/8 in., Umaid Bhawan Palace, photo: Neil Greentree. Women of the Zenana Watch a Dance Performance with Bakhat Singh, ca. 1736, Nagaur, opaque watercolor and gold on paper, 17 3/4 × 25 in., Mehrangarh Museum Trust, photo: Neil Greentree. 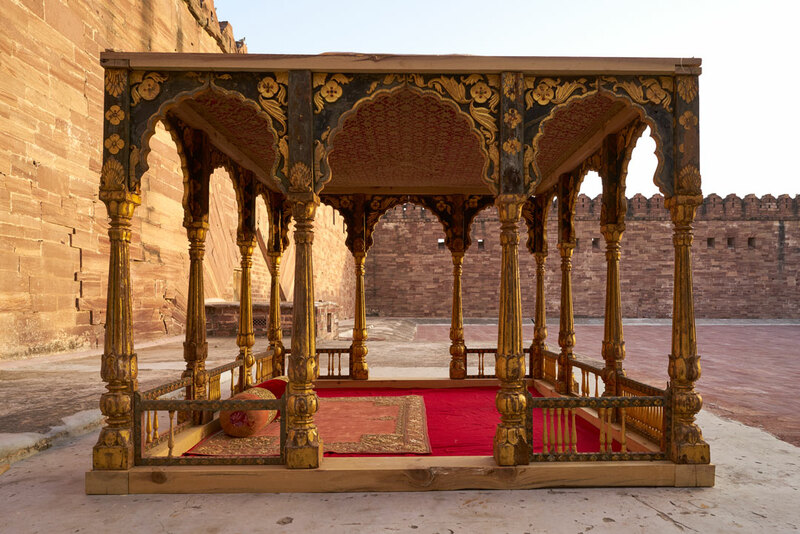 Baradari (Pavilion), 19th century, Jodhpur, wood, paint, lacquer, gold, 120 × 120 in., Mehrangarh Museum Trust, photo: Neil Greentree. A Durbar in the Zenana, ca. 1850, Bulaki, Jodhpur, opaque watercolor and gold on paper, 21 5/8 x 30 3/8 in., Mehrangarh Museum Trust, photo: Neil Greentree. Choker Necklace, 18th or 19th century, India, probably Deccan (Hyderabad), gold worked with kundan technique and set with diamonds; with champeleve enamels; strung with pearls and with pendant emerald beads and pearls, 3 1/8 × 11in., the al-Sabah Collection, Dar al-Athar al Islamiyyah, Kuwait. Jhula (Swing), late 19th century, Rajasthan, soapstone, copper, iron, 67 7/8 x 30 3/4 x 22 in., Mehrangarh Museum Trust, photo: Neil Greentree. The Court of Maharaja Man Singh, ca. 1830, Dana Bhatti, Jodhpur, opaque watercolor and gold on paper, 22 × 29 1/8 in., Mehrangarh Museum Trust, photo: Neil Greentree. 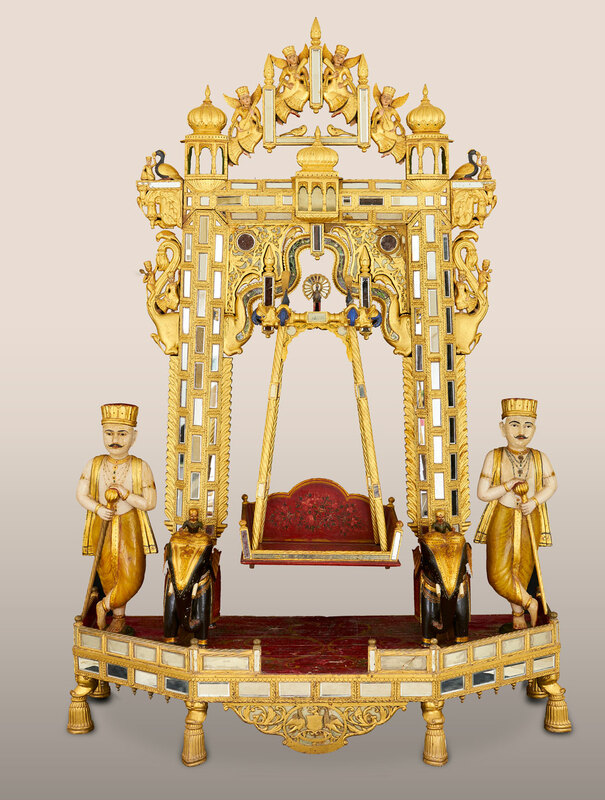 Singhasan with Chattr (Throne with Parasol), mid-19th century, Jodhpur, wood, gold, lacquer, velvet, silver gilt, Mehrangarh Museum Trust, photo: Neil Greentree. 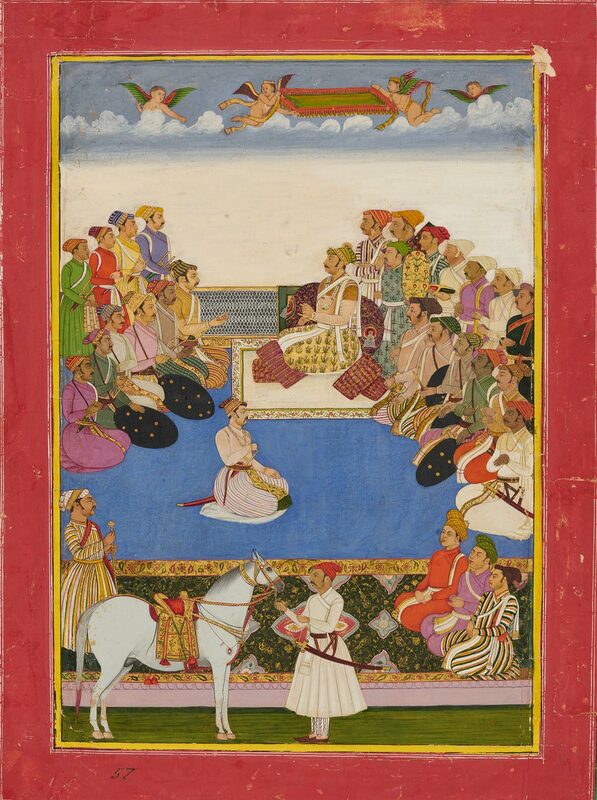 Maharaja Gaj Singh I Holding Court, ca. 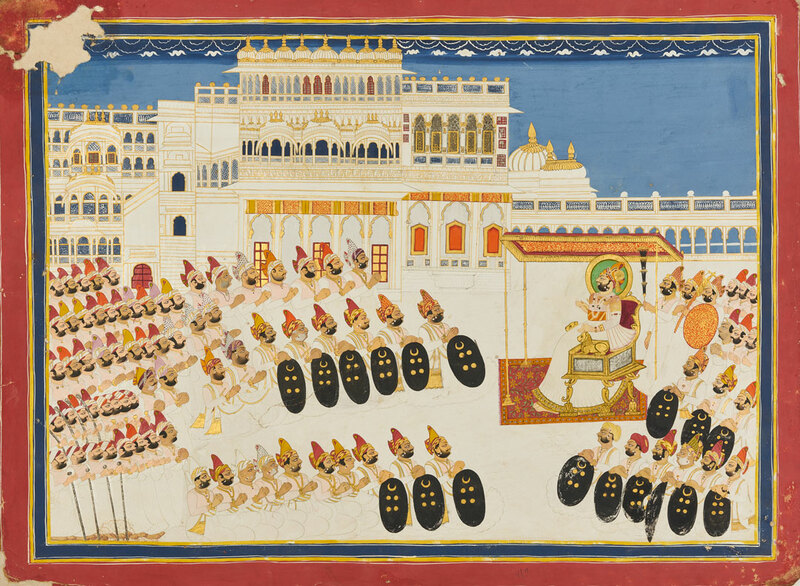 1800, Jodhpur, opaque watercolor and gold on paper, 20 1/4 x 15 in., Mehrangarh Museum Trust, photo: Neil Greentree. 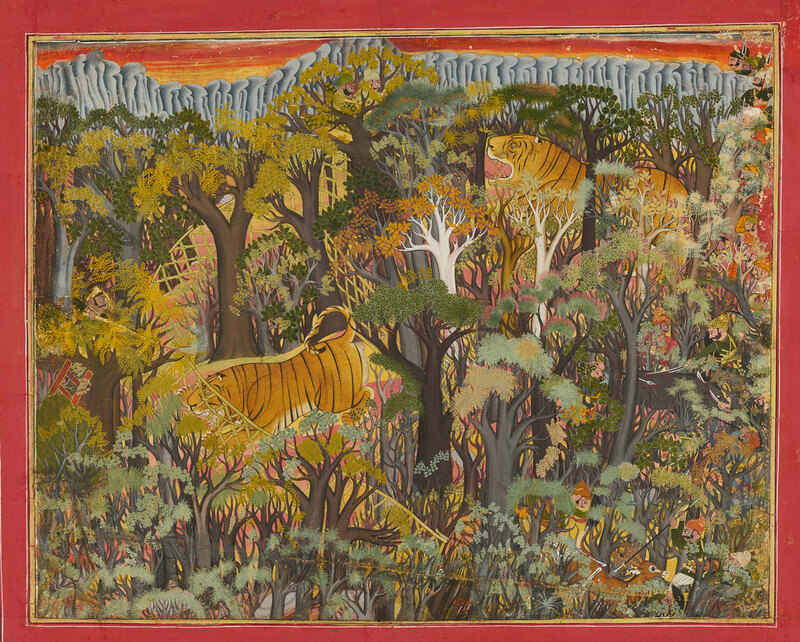 Maharao Umed Singh of Kota on a Hunt, 1780, Sheikh Taju, Kota, opaque watercolor and gold on paper, 20 1/2 x 26 in., Mehrangarh Museum Trust, photo: Neil Greentree. Umaid Bhawan Palace at sunset, photo: Neil Greentree. 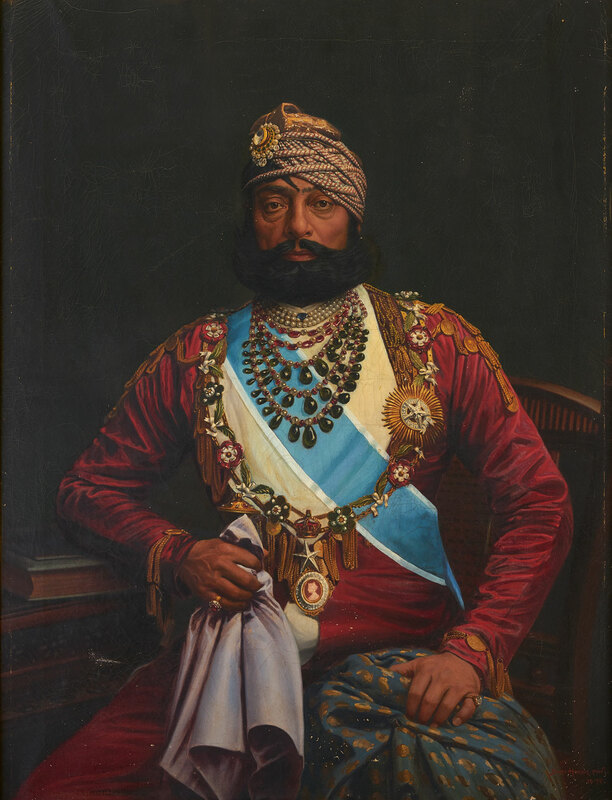 Portrait of Maharaja Jaswant Singh II, 1895, Bert Harris, Jodhpur, oil on canvas, 59 7/8 × 48 3/8 in., Umaid Bhawan Palace, photo: Neil Greentree. 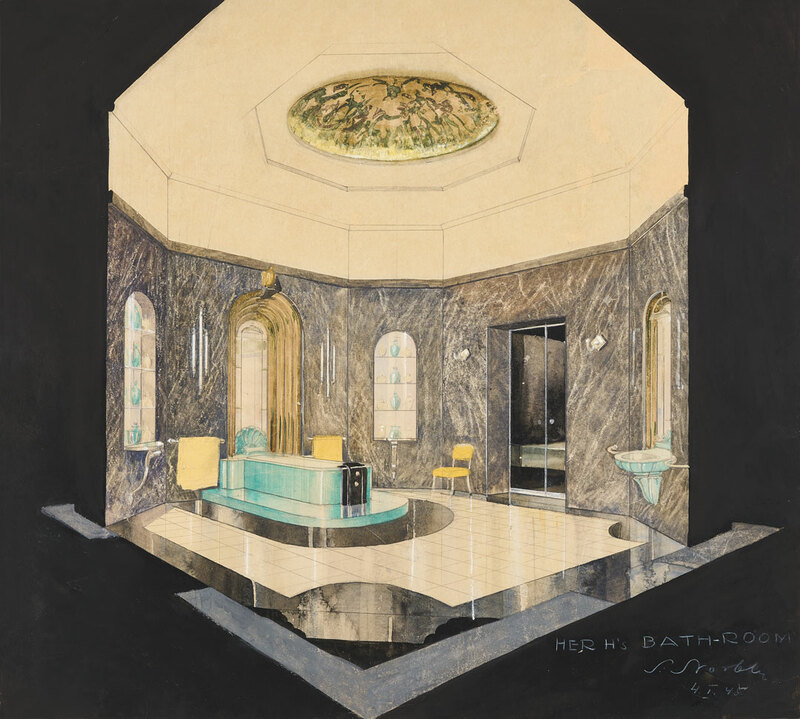 Design for Her Highness’s Bathroom at Umaid Bhawan Palace, 1944, Stefan Norblin, watercolor on paper, 21 5/8 x 19 1/4 in., Umaid Bhawan Palace, photo: Neil Greentree. 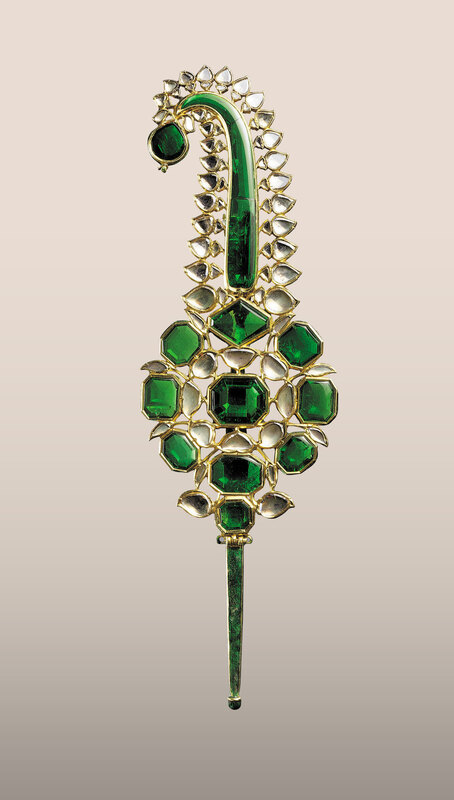 Sarpech (Turban Ornament), probably second half of 17th century, India, probably Deccan, gold with champeleve and overpainted enamels; worked in kundan technique and set with diamonds and emeralds, 6 13/16 × 2 1/16 × 1/2 in., the al-Sabah Collection, Dar al-Athar al Islamiyyah, Kuwait. Portrait of Maharaja Sardar Singh, 1896, Bert Harris, oil on canvas, Umaid Bhawan Palace, photo: Neil Greentree. 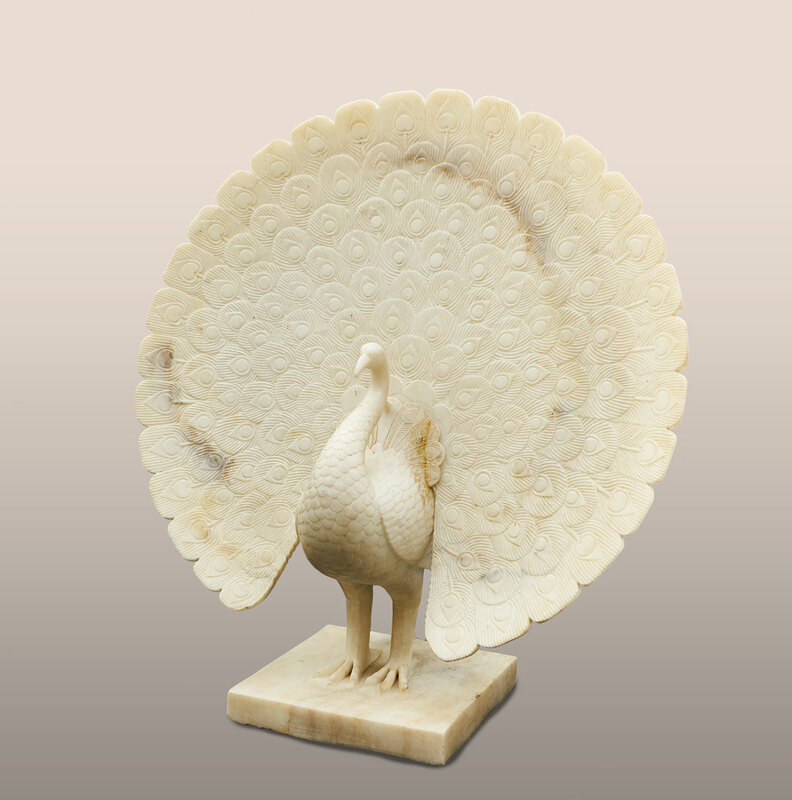 Sculpture of a Peacock, early 20th century, marble, Jodhpur, 34 1/4 x 30 3/8 x 15 in., Umaid Bhawan Palace, photo: Neil Greentree. Typeface: Bluu Next by Jean-Baptiste Morizot, Velvetyne Type Foundry.